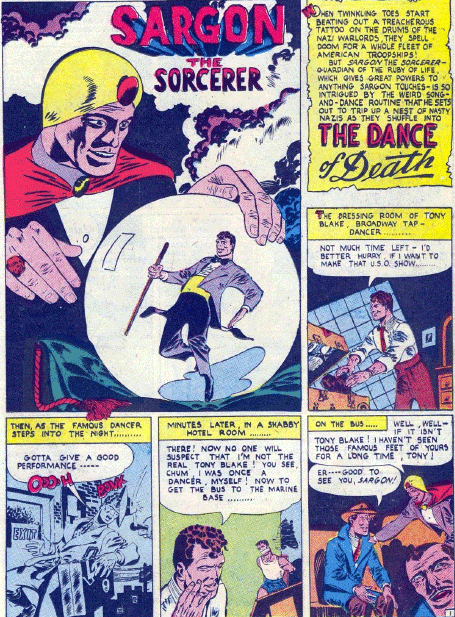 Sargon the Sorcerer, who had had a relatively bland series in his early days, despite a good origin and lots of potential, undergoes a shake up in the Late Golden Age, gaining a sidekick with an eye-watering outfit, but also a really good recurring villain, even if she did recur a bit too often. 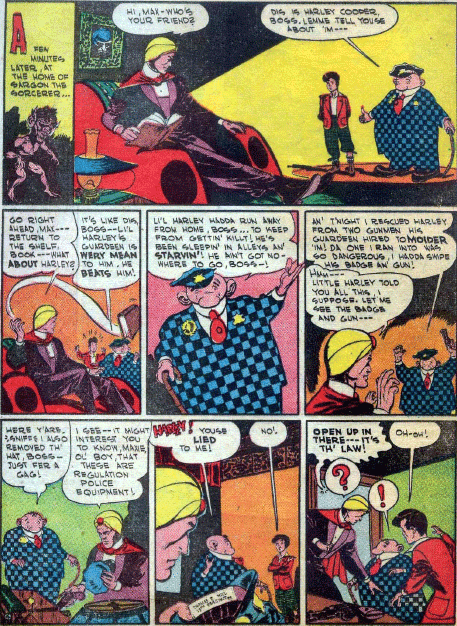 Sargon's series had moved from All-American Comics to Sensation Comics in the previous period, and continued in that book until the end of 1944. In Sensation 34 Sargon get a story immersed in World War 2, revealing the secrets behind an American expedition against the Germans in Africa. 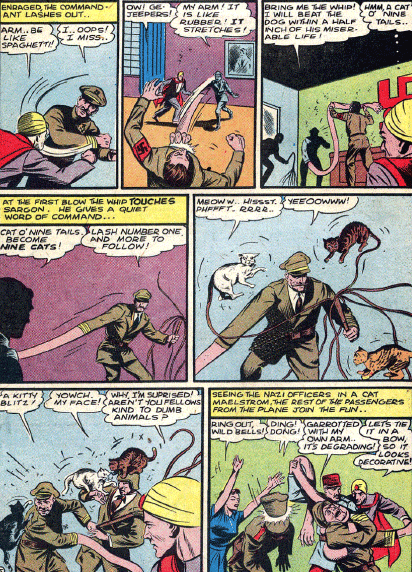 Sargon uses his Ruby of Life to stretch out a Nazi generals arms like spaghetti, and brings to life the sadists cat-o-nine-tails, turning the ends into living, and angry, cats. 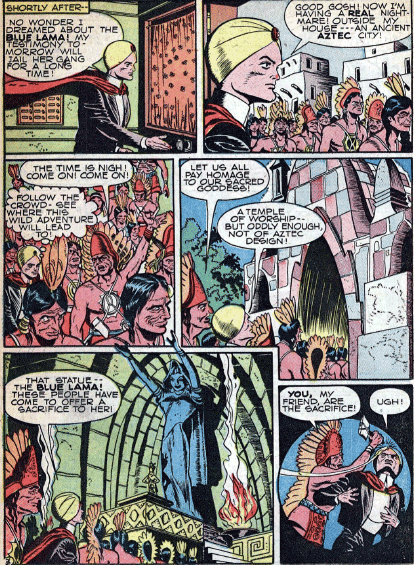 Sensation 35 sees the first Joe Kubert art on the Sargon series, though it's early Kubert, and his later work will be more impressive. 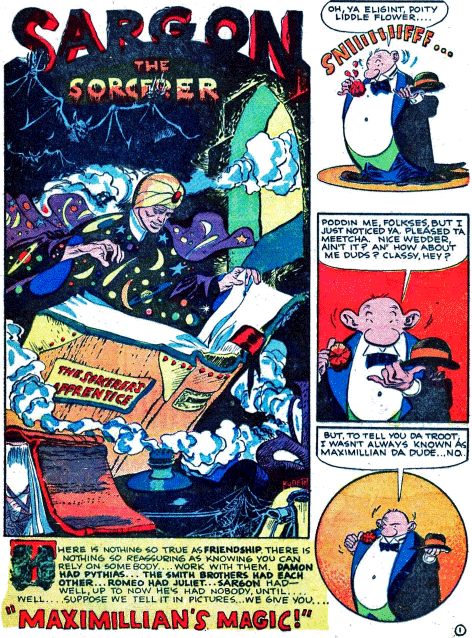 Once again, this story is immersed in World War 2, with a Nazi spy communicating with his superiors by tap dancing morse code, which get broadcast over the radio. It's definitely one of the more clever plots. But it also comes near the end of Sargon's first run. 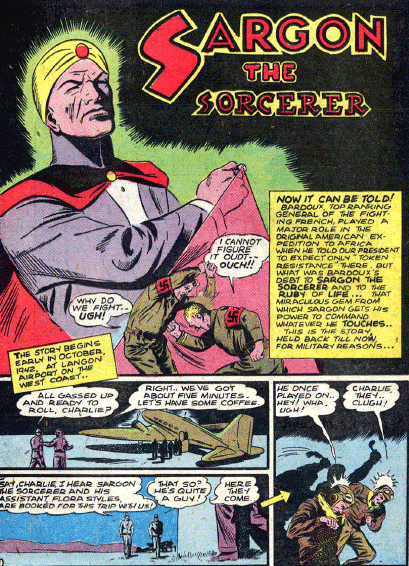 After Sensation 36, Sargon disappears for more than a year, only returning in 1946, after the war was over. 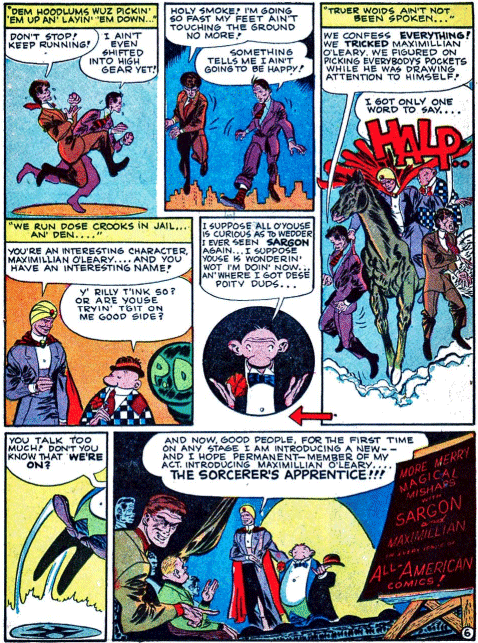 Sargon comes back in All-American 70 for the introduction of his sidekick, Maximillian O’Leary, in a story by John Wentworth and Joe Kubert. 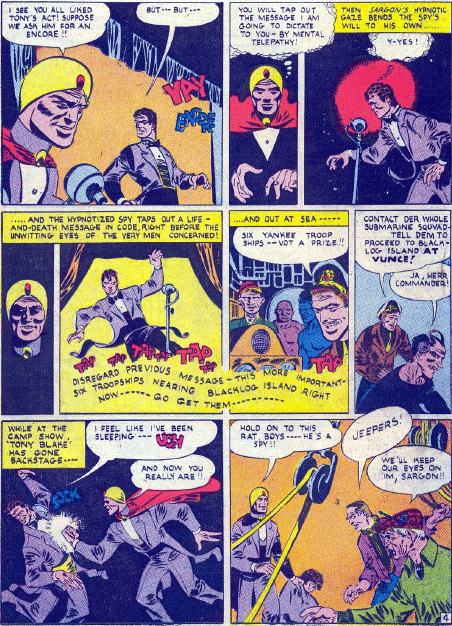 Maximillian is a wanna-be magician. 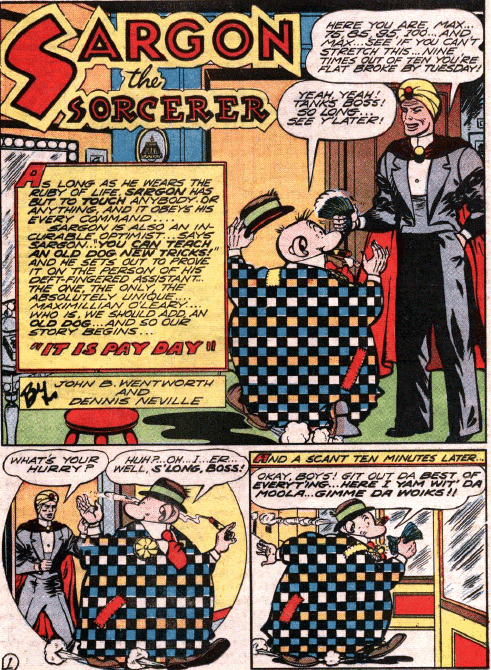 He’s even a wanna-be magician’s assistant. 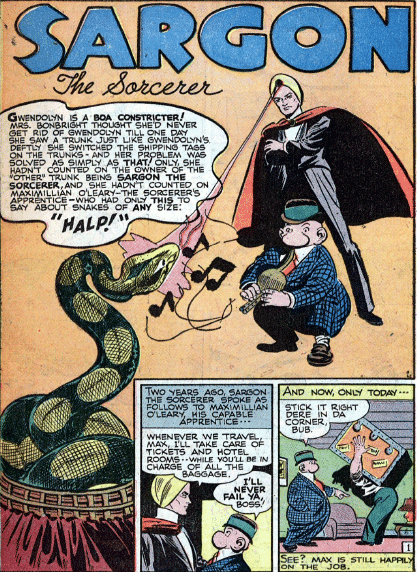 He does not choose great spots to show off his sleight of hand skills. In fact, when Sargon meets the man he assumes that O’Leary is trying to rob the box office, as does the cashier whose money he has taken. But Max is on the up and up, as Sargon soon discovers. Maximillian helps Sargon round up some actual thieves, and Sargon takes him on as his official onstage assistant, and offstage sidekick. 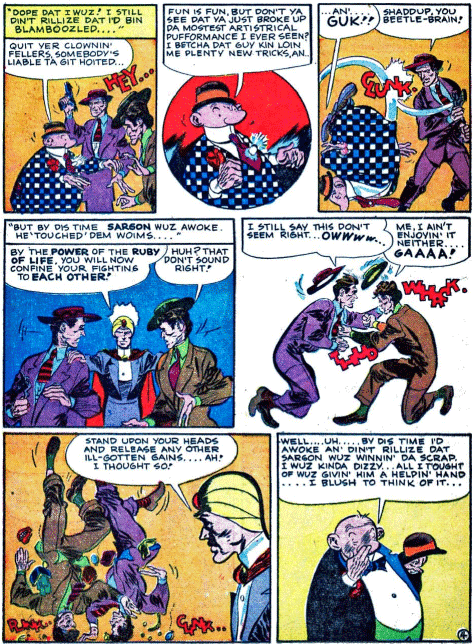 The story ends announcing that Sargon will continue in All-American, but this was in reality a one-off, and his strip returned to Sensation Comics, as well as getting a one-shot in Comic Cavalcade, though that story had neither Kubert nor Maximillian. 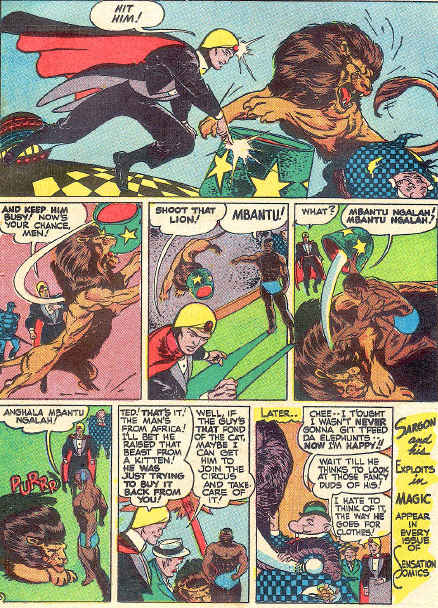 Sargon returns to Sensation Comics with issue 52, with Max and his eye-popping suit, but without Kubert. With Max in the mix, far more of Sargon's tales now centre on his magic shows, and crimes committed in and around the theatre. 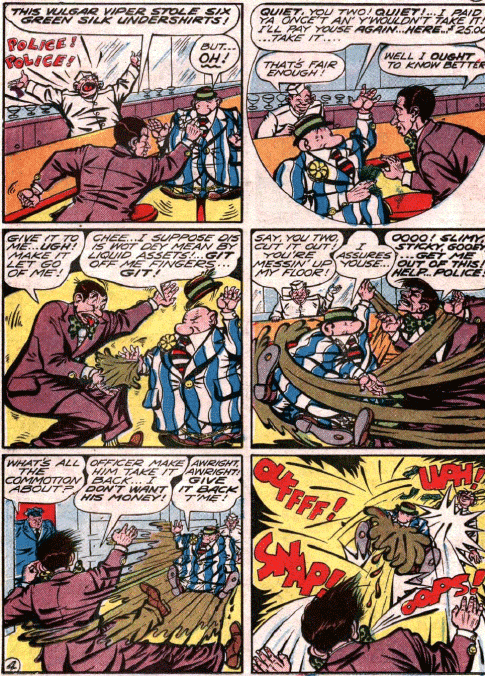 But as well, there is a broad sense of comedy in the strip that had not been there before. Kubert returns with issue 56, a story that deals with a young runaway who tells lies, and his abusive father. The magic is really quite secondary to the tale, which is curious. Sargon makes a book fly back to the bookcase, and transports himself and the boy to his father's home, but otherwise this is largely about talking out one problems, and how parents should be more loving to their kids. 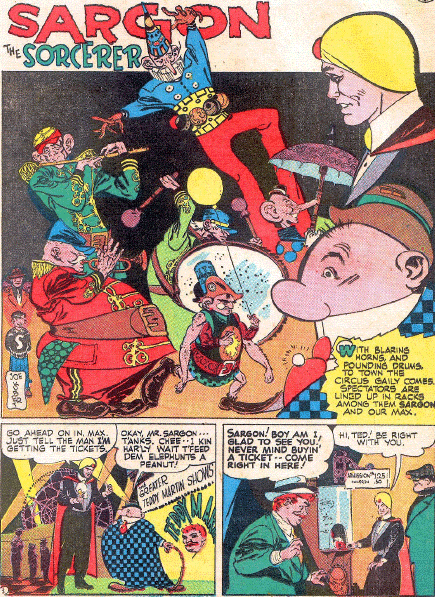 Sensation 57 sees Kubert's art really take off, as Sargon and Maximillian head to the circus. There is a mysterious man hovering around, and a runaway lion in this one. The man turns out to be the lion's real owner, who had tracked his animal all the way from Africa, in order to get it back. Kubert's participation on the strip remains occasional, which is a shame, as his stories really do stand out from the rest. Sargon continues to use his Ruby of Life to control and manipulate objects, but there is little that he is unable to do. 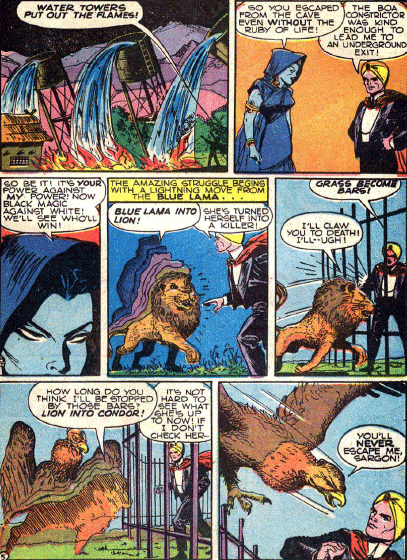 With Sensation 68, Sargon gets his first recurring villain, the Blue Lama. As was almost mandatory at this time, the Blue Lama was female, and seductive as well as dangerous. The Blue Lama appears to be the leader of an evil cult. She claims that Sargon and his Ruby of Life have interfered with her group's plans many times - though if this was the case, they were certainly operating very discretely. 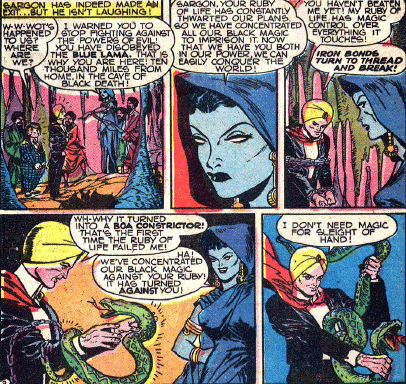 She attempts to take possession of the Ruby, but fails. 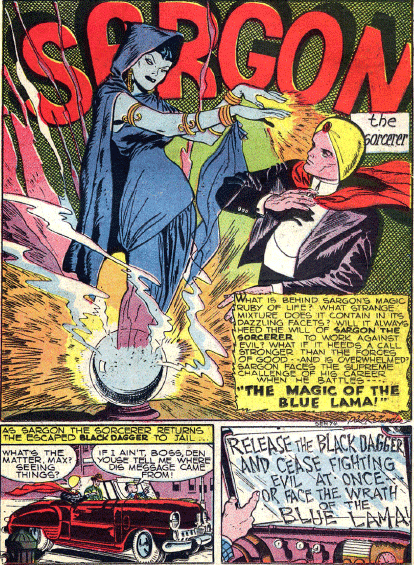 The Blue Lama did make a good enemy for Sargon, having magical powers of her own. The exact extent of them was never clear, but in her first story she is able to change her form to that of a lion, a condor and even a bolt of lightning. 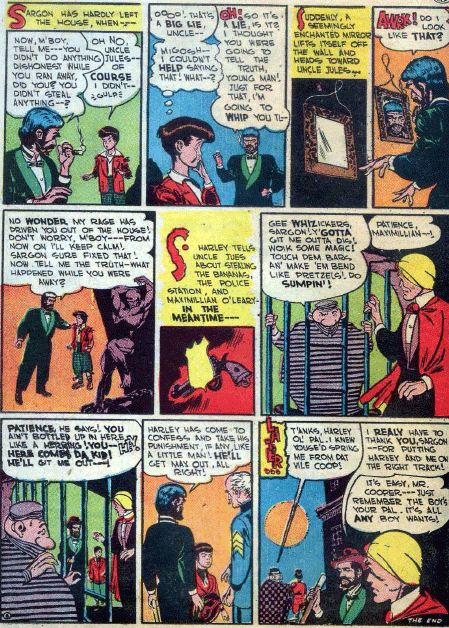 She returns in the following issue, disguising herself as Sargon's descendant, to lure him into the future, and into space. 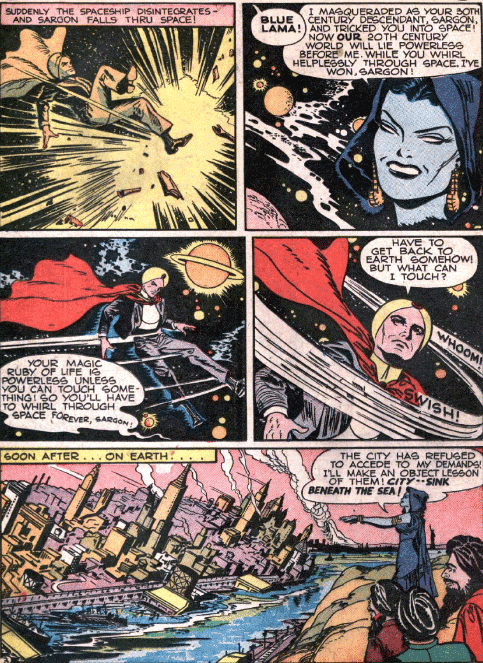 Her powers seem almost limitless, as she casually causes a city to sink into the ocean after they piss her off. Sargon is barely able to make it back to Earth and save the residents of the sunken city, undoing her spell and raising the city back up. Apparently there was no end to her drive to defeat Sargon the Sorcerer. The Blue Lama is back in Sensation 70, taking over a wax museum and bringing the statues to life to lure Sargon into battle. The mere fact that she loses is not enough to discourage her. 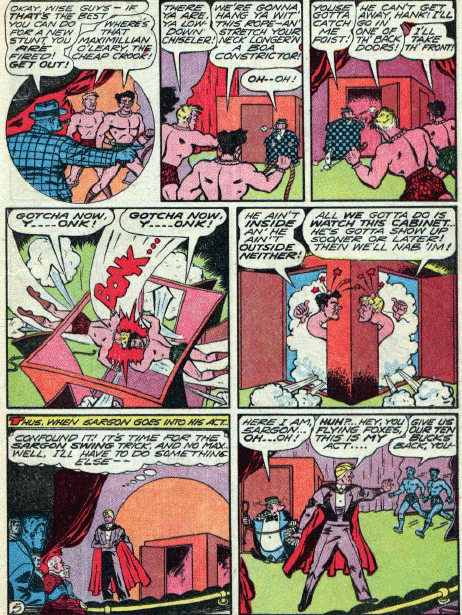 In Sensation 71 she creates a double of Maximillian, and uses Sargon's confusion to get the better of him. In this story she manages to take control of the Ruby of Life. 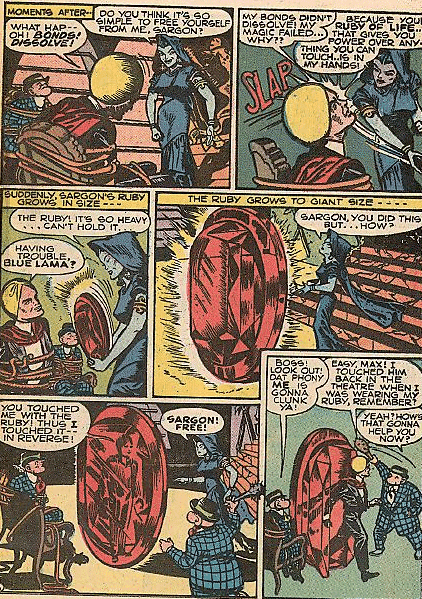 Sargon makes the ruby grow to a giant size, beyond the Blue Lama's ability to control it, and then turns the tables, making a duplicate of himself to confuse her. Sargon's final story in this period shows that the Blue Lama is even able to affect Sargon's dreams, and his perception of reality. 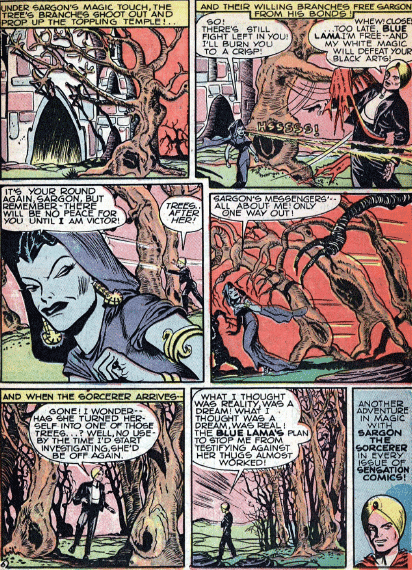 Sargon believes that he has awakened from a nightmare she was in, only to find himself in an Aztec city. 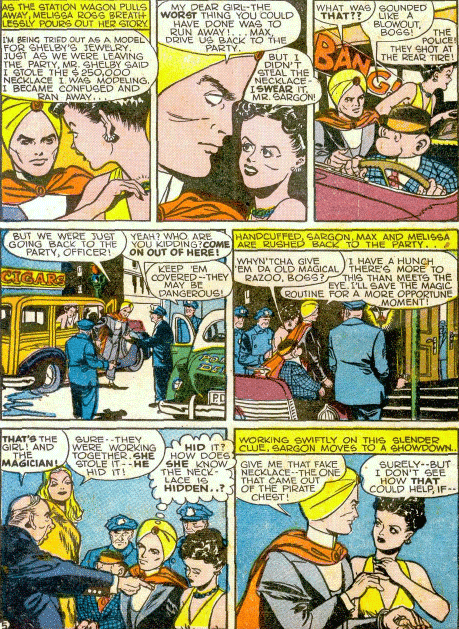 This turns out to be yet another dream, but when he manages to wake from it, she brings the city he dreamed about into the real world, trying to use it to trap him. 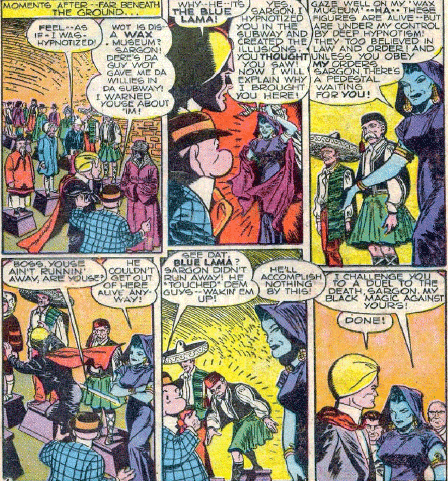 It may be too much of a good thing, but these Blue Lama stories are miles above anything that had appeared in the strip in earlier days.